As expected, newly crowned UFC featherweight king Jose Aldo will defend his title against Josh Grispi at UFC 125 on New Year’s Day. Aldo owns a dominant 18-1 professional record and has posted a perfect 8-0 mark in the WEC en route to capturing the title. He was last seen putting Manny Gamburyan to sleep at WEC 51. The underrated Grispi dons an impressive 14-1 resume and has ended all but one of his fights before the final horns have sounded. 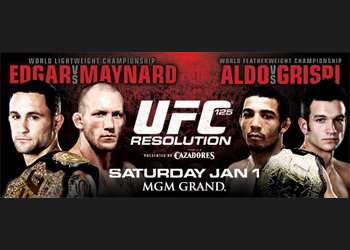 The January 1st show takes place inside the MGM Grand Garden Arena in Las Vegas, Nevada. A lightweight title scrap between champion Frankie Edgar and Gray Maynard will headline the pay-per-view broadcast. A heavyweight bout between Shane Carwin and Roy Nelson were slotted as the co-main event, however the former interim title holder was forced to withdraw due to injury.